Date Night heads to the mountains for a romantic weekend. Romance always starts with dinner. We are in Blue Ridge in the north Georgia mountains and there are a lot of excellent places to eat here. It’s quite the foodie paradise. We will get to some others in future posts, but tonight finds us right in the middle of Main Street in the historic part of town. 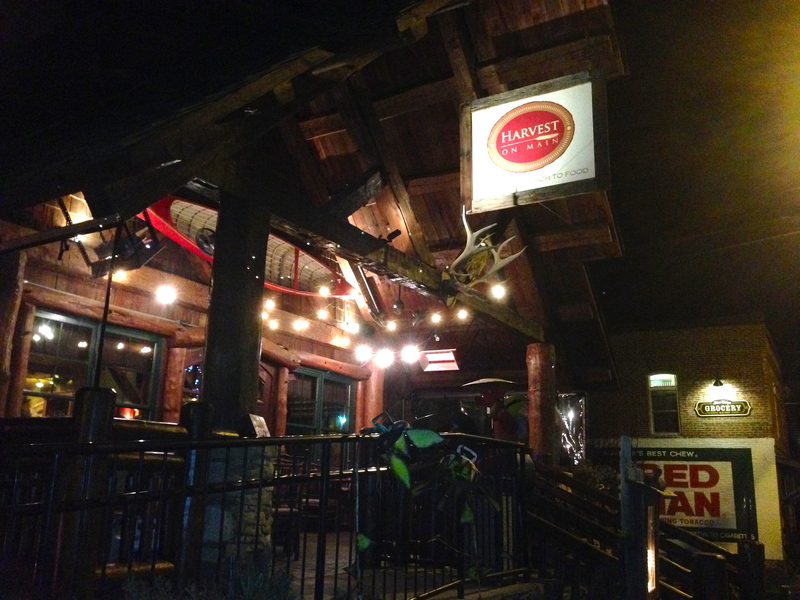 Harvest on Main was a real estate office at one time of its life. There are exposed beams and lots of wood throughout the room. 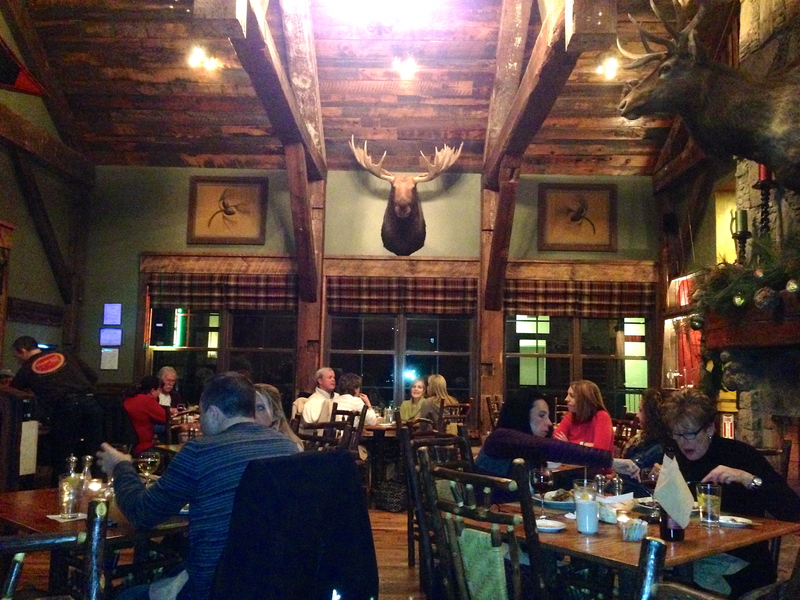 Since we are in the mountains, there has to be a few moose heads in the room and “Bullwinkle” watches over all diners. There is an old train depot nearby as well as some railroad cars. Evidently, back in “the day”, people used to use trains for transportation. We use a Prius tonight, and after battling Atlanta traffic to get here, we are ready for beer. The beer list is excellent and many choices would make us happy. 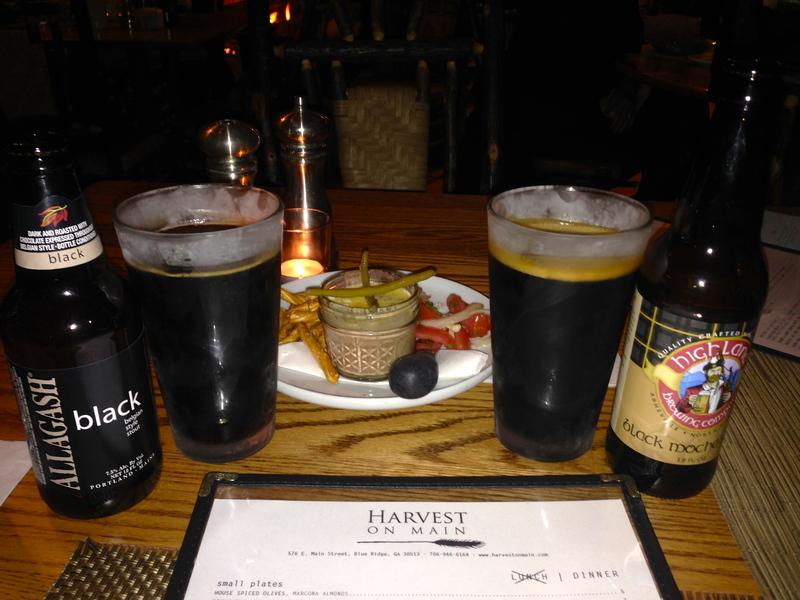 We pick an Allagash Black from Maine and a Highland Mocha Stout from North Carolina. The Allagash is the better with its Belgian flavorings, although the Highland delights with the nice taste of coffee and chocolate. There are small plates, starters and entrees on the menu. We decide to get one of each and share. First out is the Smashed Chicken Livers. We ask what these come with and we are told pretzel chips, but it comes with pretzel sticks from a bag, which is not a good delivery system for chopped liver. Soft, house-made pretzels would have been nicer. Pretzels from a bag just don’t fit this menu. 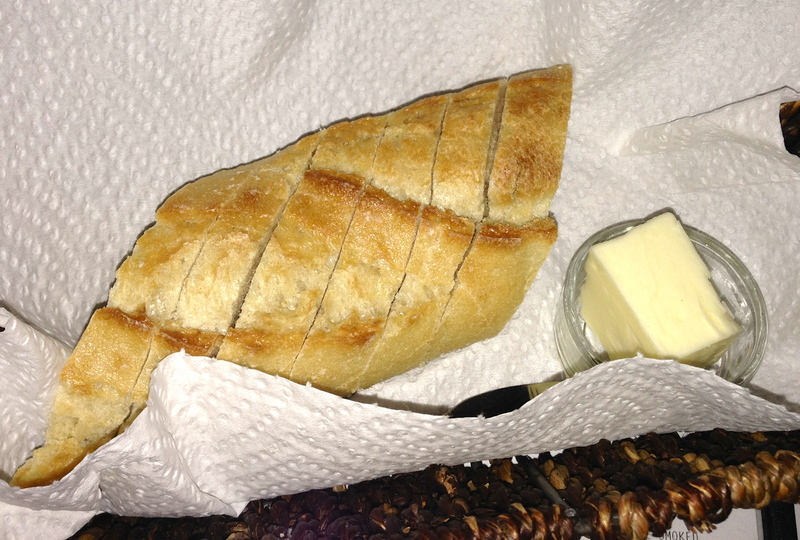 We ask for some bread and slather the tasty liver all over it. Much better! The starters are larger than the small plates. We order the Mediterranean Sampler as our starter. 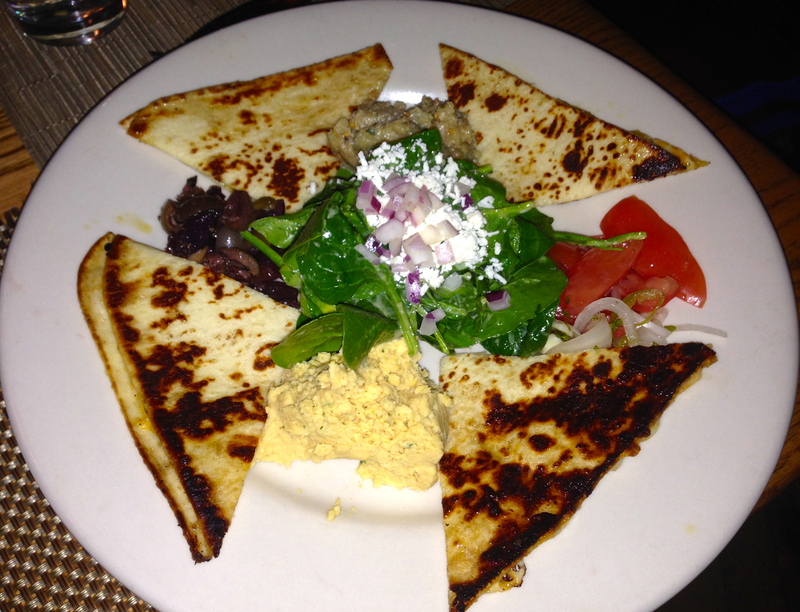 This comes with mounds of hummus, babaganoush, olives and four cheese flatbreads. They should serve the flatbread with the chopped liver. It’s the perfect thing to pile the spreads on and one of the best things on the plate. Eve loves trout, and since we are in the mountains, let’s try the Georgia Mountain Trout. 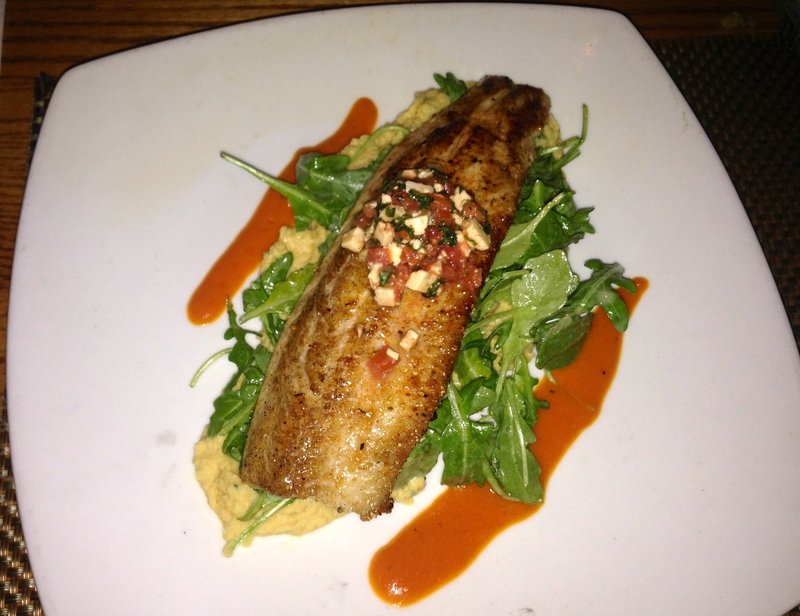 It’s a small portion of trout for $23. It comes on the same hummus we just had, but we knew that. It’s nicely seasoned and we wish there was more of it. Let’s try something new this week. 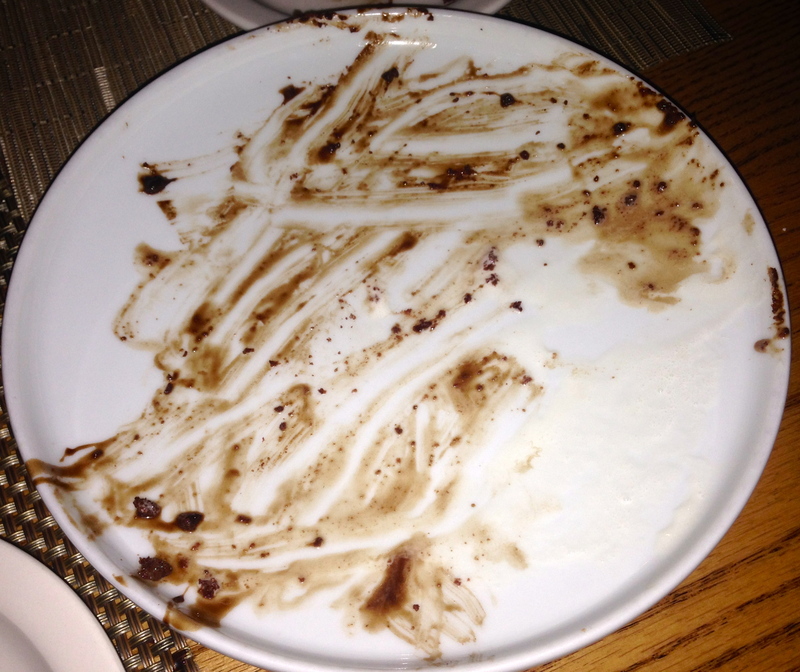 We will show you the dessert plate, and you try to guess what was on it. No peeking! If you guessed Chocolate Layer Cake, you win. It comes with a scoop of vanilla ice cream. 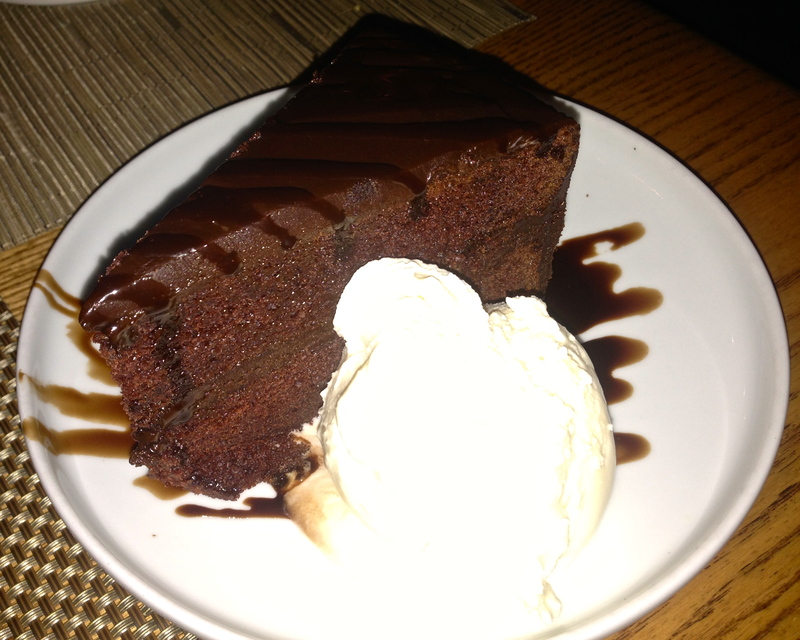 The cake is moist and full of chocolate. It is made in the bakery right next door and tastes very fresh. It’s a fine finish to our meal on Main Street. 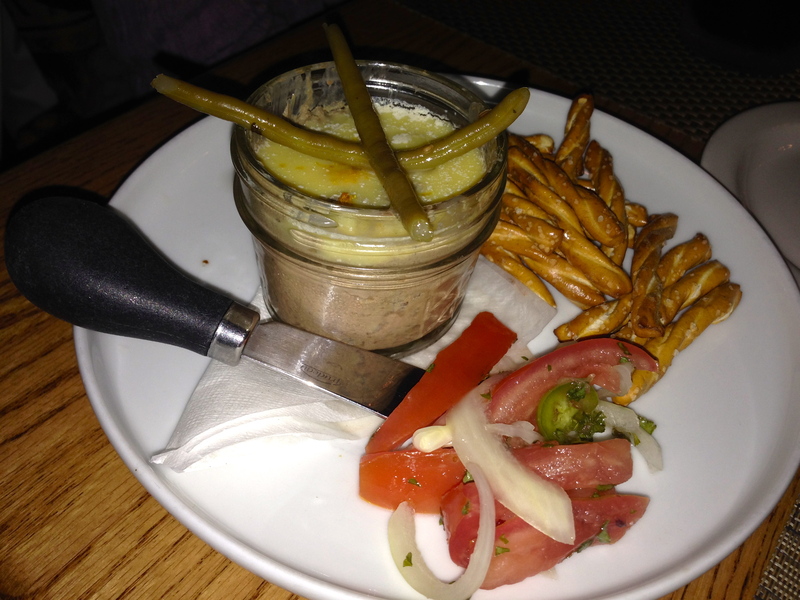 The Bottom Line on Harvest on Main: Very good. They are cooking some fine “new Southern” cuisine. The only thing that kept them from getting an “excellent” rating was those pretzel sticks. We’ve got more coming your way from Blue Ridge. Stay tuned for our further culinary adventures in the mountains.